I am nearing the end of my first six months as a stay at home mom. Remember when I told you about the nine things that surprised me the most after the first week? Well one of those things was that I was no longer happy with the decor (or rather lack thereof) of my home. I still kind of hyperventilate when I spend money but I really want the kind of home that looks nice yet comfy. My home doesn’t need to be a beautiful Pinterest home (like my sister’s house!) but I do want to add my style to the house. Since I am here a lot more now, I actually have the time to do it. I also think that having a prettier home will help me tame my inner clutter monster. One of the things I “collect” are tin cans. They can be used for so many crafts. 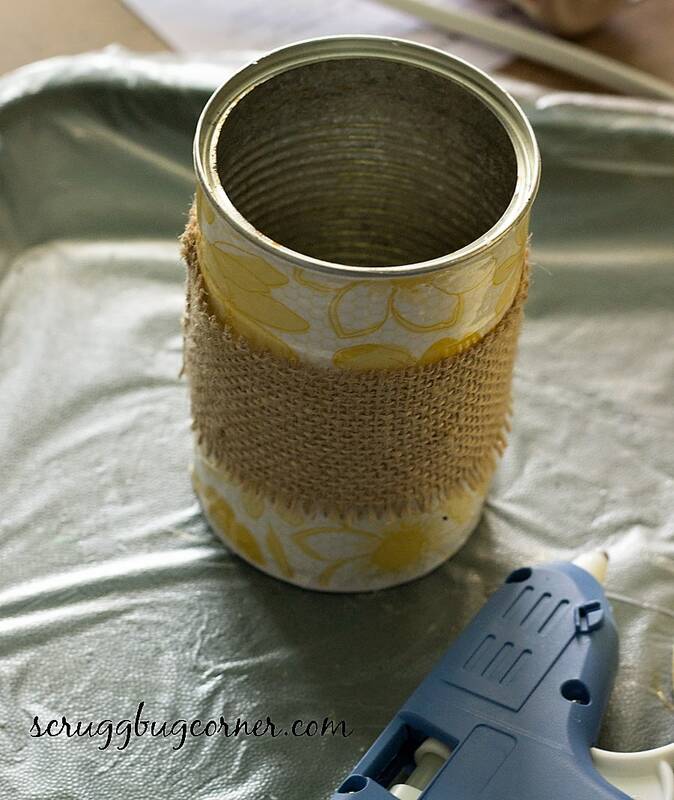 I wanted to decoupage tin cans but didn’t want them to look like tin cans. 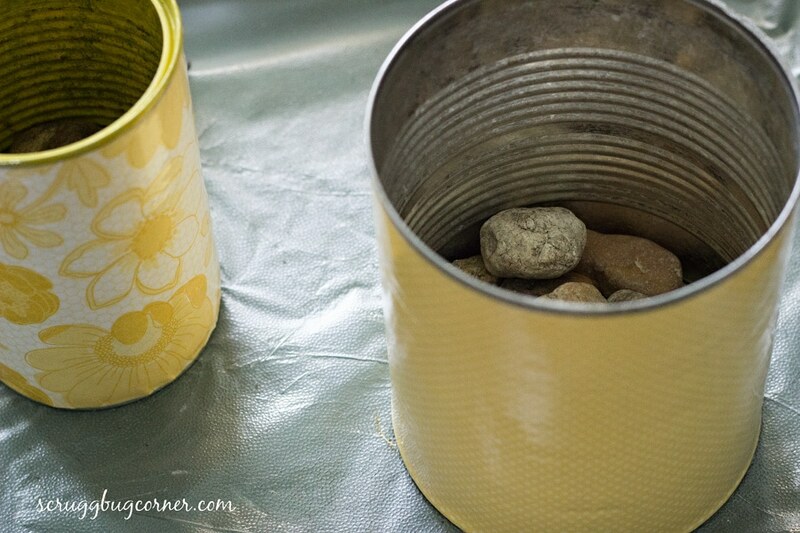 Take a look at this decoupage idea and let me know if you think they look like cans! Upcycling cheap items helps ease the clench in my gut every time I spend money. It will take me a little longer to be comfortable with our being on a single income than I thought it would it seems. Decorating with things I have to first find, then “upcycle,” is a slow process but is rewarding. My new succulent planters are now complete and were SO CHEAP!!!! I love them. Rather than guilt for spending on decorations, I am proud of what I made. Even though it was a project my kids helped me with, I didn’t really want it to look like a “kindergarten project” since it is for display in the living room. I fiddled around a bit and finally came up with a “trick” to make it look more professional. The first can I painted yellow but hated how it looked so I modge podged pretty scrapbook paper onto it. It still looked a little “kiddish” because I could see the ridges of the can beneath the paper. I solved this by modge podgeing another layer of the exact same print of scrapbook paper over the top of the first layer. After letting it dry for an hour or so, I put a coat of modge podge over the paper and allowed it to dry. I used glossy for this project but since the polycrylic is glossy, I could have used matte if I wanted. I then put a coat of polycrylic over it and allowed it to dry over night. Since I knew I would be watering the succulents and didn’t want the paper to get water-stained and discolored, I brushed on a second coat of polycrylic and allowed it to dry. I don’t want water over flowing onto my furniture so I chose NOT to drill a hole in the cans. Instead I put a layer of rocks at the bottom of the cans and put some newspaper on top of the rocks before planting the succulents to allow excess water to have somewhere to drain. I’m not sure if it will work but I will let you know! I wanted to add a little variety so I embellished one can with a strip of burlap hot glued around it. They came out so pretty. 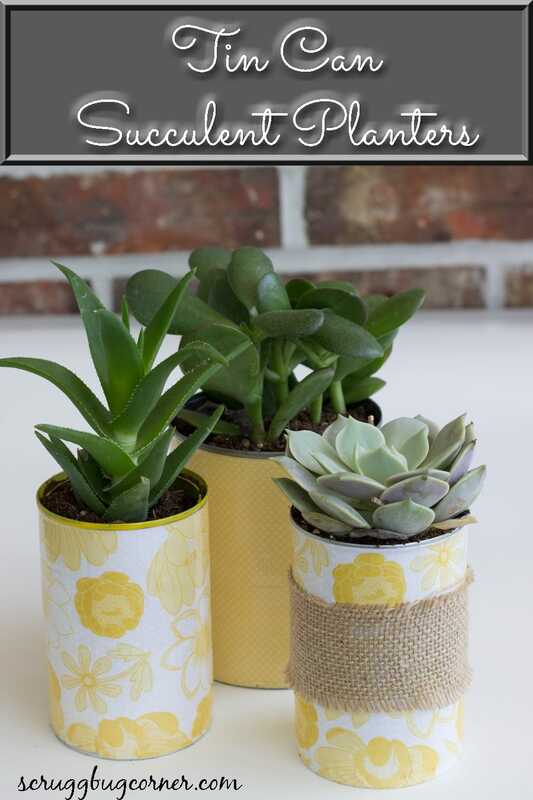 The polycrylic really makes them look like store bought accessories rather than tin can succulent planters! This is such a cool idea Herchel! And I love modge podge…that stuff is awesome. I used to decopauge things all the time! 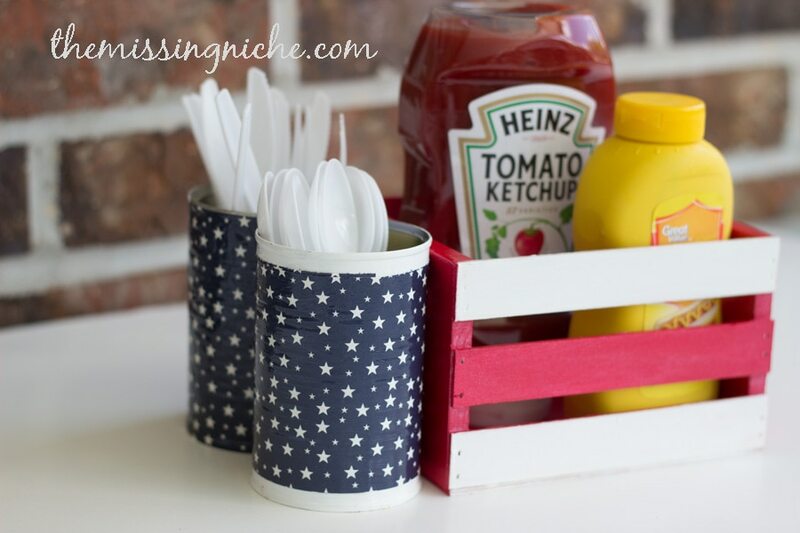 I hope you will link it up with us…this is perfect for decorating for BBQs! Regardless though, I just pinned it…now I just need to find time to try it! Love this idea! Great pattern choice, goes wonderful with the succulents. You too! The yellow looks so cheerful and positive to me. These look so good – and much nicer than something you would buy from the store, and no one would guess they used to be a tin can! I like that you can make a ‘grown up’ version for the living room but you could also get the kids involved to make a few more haphazard looking ones for the kitchen windowsill maybe! These containers could also be used for cutlery to put on your Barbeque table with matching napkins. My daughter put burlap & a pretty ribbon on her cans & matched it up with napkins & plastic cutlery. Great idea! 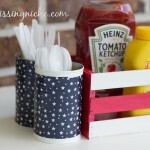 We made a set with red and white stripes and navy blue with stars to use during our July 4th barbecue!